Let’s examine below code snippet. L10, call a user defined function, which might be time-consuming and error-prone. L11-L17, run logic conditionally, according to myfun output. People may be stucked at L10 for quite a while, and nowhere to check what’s going on. This is definitely not good. 8:     echo "Action done: my_fun"
15:    echo "Error. msg: $output"
1.2 Use Linux tee Command. 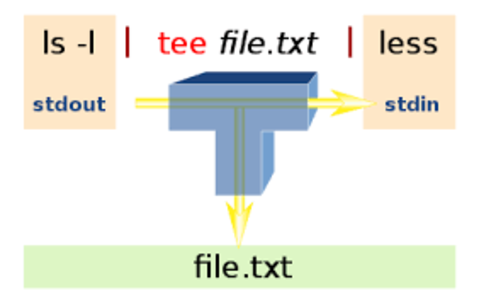 tee is a command using standard streams which reads standard input and writes it to both standard output and one or more files, effectively duplicating its input. Unlike usual pipe redirection, tee can do two redirections. Using tee, users can see detail progress now. 1.3 Don’t Get Fooled By Exit Code. What $? would be, after running below commands? $? is 0, zero! Surprising, isn’t it? This is a tricky part of shell scripting. Running a list of commands in one line, we get the exit code of the last command. If you want to fail this line whenever any command fails, run set -o pipefail. See more discussion in StackOverflow. Use set -o pipefail, to detect possible failures. my_fun 2>&1 | tee -a "$tmp_log_file"